The Broads begin at Brundall. This is furthest outer Norwich; Brundall, and particularly adjoining Brundall Gardens, is Norwich's Metroland, with two railway stations, bowling greens, boating on the river and 1920s mock-tudor in abundance. How Betjeman must have loved it. And I liked it a lot too; I had been cycling in nearby parishes which had, for Norfolk, a somewhat unenlightened attitude to church-opening, so it was a pleasure to come here and be able to step inside this lovely space. But first, I had to find it. 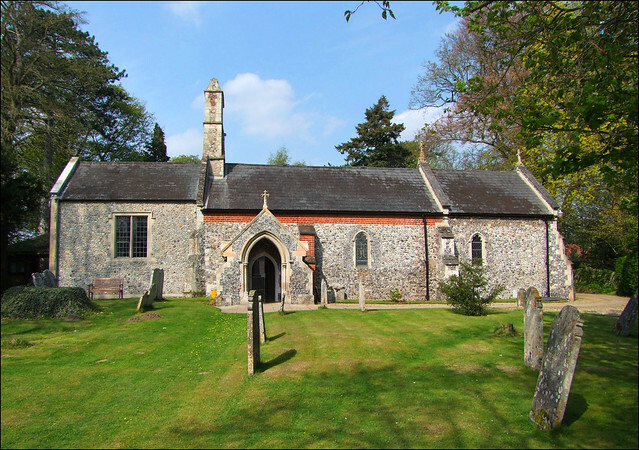 St Lawrence is a long, towerless church set back from the road and hidden in a garden-like churchyard with its rectory and parish hall. You step through a pretty thatched lychgate which serves as the parish memorial to the local boys lost in the mud and blood of Flanders and France. The path takes you to the east of the church and onto the south side, where the neat graveyard slopes down towards the river. Many churchyards have benches, but here was the first time today I was unable to resist sitting down and soaking up the sunshine and the birdsong. It was idyllic. St Lawrence is a curious building. There probably never was a tower. A tall bellcote sits about a third of the way down the nave, level with the porch. As Pevsner notes, it appears to be medieval. The north aisle you see as you walk from the lych gate dates from as recently as 1900, but everything you see from the south side is apparently 13th Century, except that, in reality, the bellcote sits above the medieval western gable; early in the 20th Century, the nave was extended westwards. if you stand to the south you can see that the building must get darker inside the further east you go. You step into what is essentially an Edwardian era interior, that period of High Church triumphalism and gravitas between the end of the 19th Century and the First World War. It is the Church of England at its dramatic peak. But there are plenty of medieval survivals here, including East Anglia's only lead font. it is contemporary with the church building, its design depicting a repeated motif of the crucifixion and fleur-de-lys. It seems curiously primitive compared with lead fonts found elsewhere in the country, for example Low Halstow and Brookland in Kent. There is good glass by Clayton and Bell, less good by Kempe & Co, but they both let coloured light fall across the dark wood furnishings, which is very atmospheric. In the north aisle, and probably installed here as part of the restoration in 1900, there is a fine roundel of continental glass depicting the church's patron Saint with his grid iron. It is probably 18th Century, I should think, unless it is one of those clever copies by the King workshop. Certainly of the 20th Century is the set of royal arms above the south door, because it is for Elizabeth II, one of several sets in East Anglia but probably the only one which appears to be painted on a fibre glass panel. The view eastwards is to the early 20th Century roodscreen and the darkness of the chancel beyond. You can see that St Lawrence was restored for shadowy, incense-led worship. While I was in the church an old gentleman came in to 'prepare the altar' for the following day's Communion, which I found pleasing and perhaps even reassuring. As I chatted to him, I looked at the memorials either side of the sanctuary. They are both fascinating. The one on the south side is to Charles Leath, Midshipman of the British Navy... who died at sea in 1804. The memorial features his sword and sextant in relief at the top. Even more striking is the relief on the memorial on the opposite wall. It dates from half a century later, and remembers Robert Cubitt and his wife Henrietta. The relief depicts a schooner with its sails furled, basking on a choppy sea. Under the relief are the words Such is Life.